Nokia has released two very similar Symbian business-oriented smartphones recently, the QWERTY keyboard-packing E71 and this slim slider. The phones have very similar specs – they both run on Symbian 9.2 OS, both have the same 3.2 megapixel camera, Wi-Fi and A-GPS, virtually the same on-screen display and a host of identical apps. The only real difference in fact appears to be size (the E66 is less wide, but the E71 is slimmer) and the E71's QWERTY keyboard. They're even available for roughly the same price. If you don't need a QWERTY keyboard, then the E66 is probably the one to go for. Available in black or white, it's the better looking of the pair, sleek and lean, with the upper part of the slide taking up just a fraction of the 14mm depth. Beneath the large 2.4in screen is a tidy arrangement of two soft keys, call start and stop, a back button and a square D-pad surrounded by four shortcut keys for home, contacts, calendar and messages. Like the E71, the backlit D-pad doubles as the message alarm, flashing when you've got mail. The 16 million colour screen is admirably sharp and clear, and easily bright enough to read in sunlight. There's a light sensor onboard too which automatically tones down the light when you don't need it to help save your battery. The sturdily constructed slide has a nicely robust feel to it as it glides out – not too readily, but certainly without the need for too much pressure. The keypad beneath doesn't make a spectacle of itself by trying to be different but concentrates on functionality, with well-spaced, responsive keys in a tactile plastic that's not quite rubberised, but not quite smooth. It's just right. It's packed with connectivity features including Wi-Fi (very easy to set up), USB, Bluetooth (fast data and stereo) and even infrared. It's also got HSDPA-style 3G offering download speeds of up to 3.6Mbps, as well as an instant messaging client and Push To Talk capability. The Symbian S60 web browser may not be quite as smooth as those on the iPhone or HTC's Touch Diamond, but it's close, and for our money it's better than Opera (though you can of course download that too if you like). The fast connection means you're never hanging around long for rendering and while the zoom is limited to 50, 75, 100 and 125 per cent options, in practise we found this was all that was necessary to read any pages. There's a full screen option which comes in handy for watching streaming video and the page optimisation settings, though a little crude, generally worked well to render pages readable. The built-in accelerator worked very well too, flipping pages between portrait and landscape modes quickly and efficiently. The 3.2 megapixel camera may not be the ultimate in cameraphone photography but even without one of those fancy Carl Zeiss lenses that Nokia's N-series is so fond of, it's no slouch. It's quick to get into (about three seconds) and pictures were generally clear and sharp within their limits, and the autofocus seemed to work pretty well. There's also an extended digital zoom that will keep on magnifying even when the resolution is set to maximum (2,048x1,536 pixels). The LED photolight is as good as most of its ilk, though of course it's only really effective within about a metre of the subject. Nokia's photo editing suite however is one of the best around and it's all present and correct here, with a wide range of options for tinkering with your snaps. Video, as is often the case, lets it down a bit, only going up to QVGA (320x240 pixels) resolution at 15 frames per second though it's still perfectly capable if movement isn't too fast and the light's good. The Symbian music player works well if you don't use Nokia's fiddly synchronisation suite and just drag and drop your MP3 or AAC files onto the phone instead. There's 110MB of storage onboard plus you can add up to 8GB with a microSD memory card. The usual headphones are okay but not exceptional. You'll probably need an adaptor to upgrade them though, since the headphone jack is 2.5mm instead of the much more popular 3.5mm. The built-in AGPS with Nokia Maps on the supplied 2GB microSD memory card is an excellent sat-nav accessory, only let down by the comparatively small screen (biggish for a phone, but smallish for a sat-nav) which is a bit of a squint if you're driving. In practise though it found our position quickly and offered accurate directions around our corner of north London. It comes with QuickOffice4 which allows you to read and create Word, Excel and PowerPoint documents as well as Adobe Reader for viewing PDFs. There's also a barcode reader, a text scanner, a wireless keyboard connector, quick notes and a voice recorder (with dedicated button on the side). 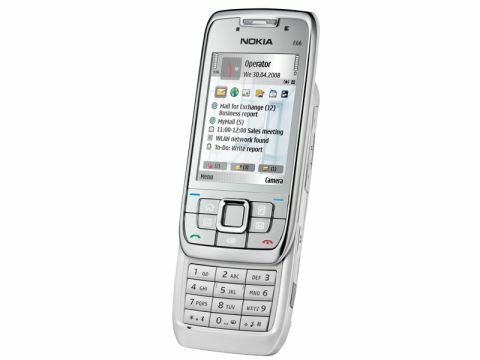 This being a Symbian phone there's also a host of additional applications you can download. The battery specs are slightly less than those of the E71 but in use we didn't really notice the difference, recharging both of them after three days of moderate use. The E66 is a tremendous business tool that does everything it's supposed to easily and efficiently, without you having to put too much effort into figuring out how it does it. It's fully connected, comes with a bunch of useful free apps including Nokia Maps and even if the fun options like its 3.2-megapixel camera and music player aren't the best available, they're more than good enough to brighten the busy working day.